Edit Serif Pro is the first release of the Edit Collection, a brand new super family designed by Christoph Dunst and published by Atlas Font Foundry which is available in 12 styles, 6 weights and italics, a wide range of OpenType features and multilingual support. It was designed to create multi-platform brands and editorial typography. It merge well on small, medium and large sizes. With a humanist touch this versatile font can be use for any kind of projects. Enjoy! 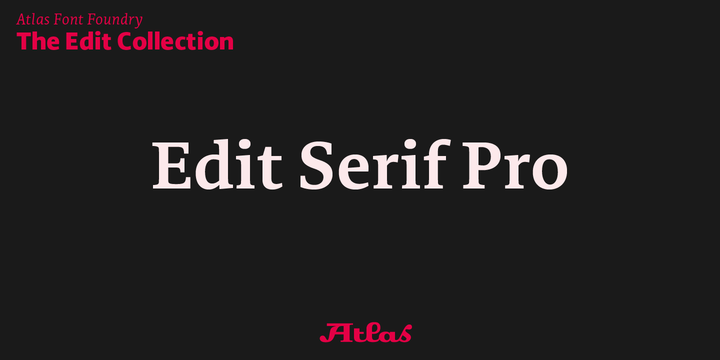 Note: “Edit Serif Pro” ia a trademark of Atlas Font Foundry. A font description published on Tuesday, December 19th, 2017 in Atlas Font Foundry, Christoph Dunst, Fonts by Alexandra that has 1,889 views.